This Item is a Pre-Order and will arrive on: Tuesday July 02nd 2019 ! APR190556 - FIRST TIME IN PAPERBACK! 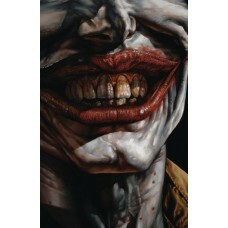 From writer Brian Azzarello and artist Lee Bermejo, the team behind the best-selling BATMAN: DAMNED, JOKER tells the story of one very dark night in Gotham City-a harrowing night of revenge, murder and crime as only The Joker can deliver it, as he brutally takes back his stolen assets from the Penguin, the Riddler, Two-Face, Killer Croc and others.